Being a few weeks into the New Year, many of you are getting into the habit of eating clean, incorporating healthy fats into your diet, hitting the gym, and participating in regular cardiovascular activity. With so many different diet choices out there these days, you may find yourself wondering which one really is THE best diet. The U.S. News Health and Wellness section released its annual ranking of the top 32 diets, according to health experts. It’s always great idea to do research before starting a diet in order to make sure you’re comfortable with the portion sizes and food choices. 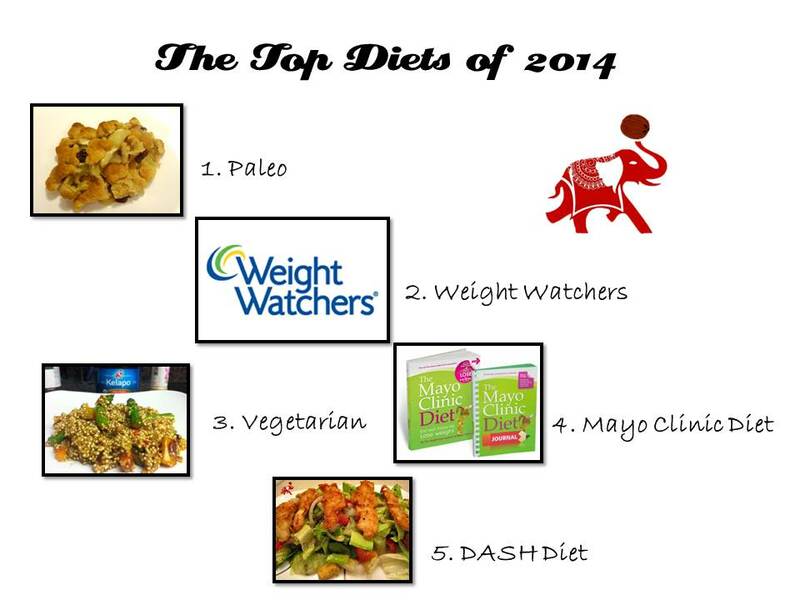 Many of the top picks allow you to eat my go-to healthy fat, coconut oil. Paleo – No surprised this was the number one Googled diet in 2013, the paleo diet focuses on eating the way that hunters and gathers use to thousands of years ago. Think of it this way – if cavemen didn’t eat it, then it’s not on the paleo diet. Refined sugar, dairy, legumes, and grains are replaced with meat, fish, poultry, fruits, and vegetables. Coconut oil is one of the approved oils that may be used while following the paleo diet. Try making our cranberry orange scones or apple cobbler, which are both paleo approved! Weight Watchers – The Weight Watchers Points Plus program is designed to assign points to every food based on its protein, carbohydrate, fat, fiber, calories, and how hard your body works to burn it off. Points will then be added up throughout the day based upon the food choices you make. The Weight Watchers Community supports coconut oil in replacement for olive oil and counts the tropical oil as 1 Points Plus for 1 teaspoon coconut oil and 4 Points Plus for 1 tablespoon of coconut oil. For a quick dinner and dessert, whip up these gluten-free coconut chicken tenders and coconut banana breakfast cake. Vegetarian Diet – The vegetarian diet strays away from meats, fish, and poultry. Depending on how strict you are, you can still incorporate eggs and dairy products into dishes. Vegetarians who want to eliminate butter from their diet may choose to cook and bake with coconut oil. According to the report, “research has linked vegetarian diets to reducing cholesterol, blood pressure, and the risk of heart disease.” Vegetarian dishes such as our three bean chili and sweet potato corn bread are great for this cold weather! Mayo Clinic Diet – Using the Mayo Clinic Diet Book as a guide, you’ll encounter a two-step process – “Lost it” and “Live it” which are made to help develop a healthy eating pattern from here on out. The first phase focuses on 15 key habits, ones to add and ones to lose, in which new choices are made, calories are not counted, and snacking on fruits and vegetables is encouraged. The second phase will help you learn how to count calories in order to lose or maintain weight and which foods those calories should come from. For a great grab-and-go breakfast idea, try our protein packed breakfast cookies and make sautéed tilapia with mashed sweet potatoes for lunch. Both recipes are made with coconut oil, in place of butter, which allows you get your recommended serving of healthy fats. DASH Diet– Dietary Approach to Stop Hypertension, also known as the DASH diet, was created specifically to help fight high blood pressure. Beyond reducing your sodium intake, this plan emphasizes on fruits, veggies, whole grains, lean protein, and low-fat dairy, while cutting back on sweets and red meat. According to the report, “studies have shown that the DASH diet can lower blood pressure while increasing “good” HDL cholesterol and decease “bad” LDL cholesterol and triglycerides.” Coconut oil may be another possible way to help with cholesterol; it also contains no sodium. Our light lemon chicken salad is a perfect dish to try! 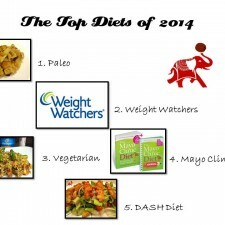 To see all of the diets listed, make sure to visit U.S. News Health and Wellness. It may take some trial and error before you find the diet that’s best fitted for your lifestyle, but don’t hesitate to keep experimenting. My tips on starting and keeping healthy habits may help guide you along and make sure to check out these top 5 foods that should be added to your New Year, New You diet plan. Coconut oil on weight watchers is 7 points! Great content and informative. Learn a lot today.